If you have worked with raw acrylic resins before you probably noticed that it takes much more effort to properly disperse dry pigments within the resin. Pigments often stay clumped up and resulting pastes or liquids are lacking quality. This unique product, previously accessible only to paint manufacturers will solve the problem! 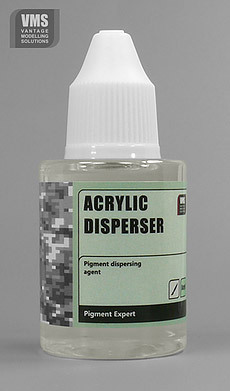 It will help you while dispersing your pigments in acrylic resins to easily give them desired colour. Product not only ensures there are no nasty pigment clumps, it allows for the most economical use of your pigments, as well dispersed pigments colour the resin much better! With disperser you will be able to colour the same amount of resin as before but with half the amount of pigments!